My weekend? Sunny, active, great! Saturday morning, 7.45am. Prepared with hiking shoes, sunglasses and lunch packages, 16 motivated people gathered at Pacific Central to spend the day in Squamish. Everyone was ready for the big hike. Well, everyone except for our bus… Unfortunately, the bus company cancelled the ride we booked our tickets for. To be honest, that was not the best news to hear at this time of the day. Going back home? No way! So, some hot discussions later, a bus was eventually arranged for us and the adventure could start. About an hour later, we stepped out of the bus. We stood directly in front of the gondola, the one we would take to get down after our hike (at least that is what we still thought would happen). But before heading to the trail, we had to celebrate. It was Lore’s birthday! And so, we had a chocolate cupcake for her with a candle, a birthday song, a crown and even a birthday balloon; the full package for our Belgian birthday girl. The sky promised a lovely day and even in the shadow under the trees, it was perfect! Just like many other people, we followed the signs of the sea-to-summit trail (again, that is what we thought). The first part of the trail was quite steep with many stairs and steps of stones. No problem for our motivated group, so we made our way up along the waterfall with some breaks to enjoy the views. Every ten minutes, I heard a ‘Happy birthday’ – ‘Thank you’ conversation between Lore and some hikers on the trail. The balloon did its job, so she a lot of attention during the day. The final part before reaching the top of the mountain was more challenging. The trail ended in rocks that we had to climb up. Ropes installed in the rocks and a ladder helped us to overcome the last metres until the top. Not being surrounded by trees anymore, finally allowed us to see where we were actually standing. Wow! The view was just amazing! After the past exhausting hours, it was time for lunch break. We found the perfect spot and could enjoy our sandwiches while looking at mountains with snowy tops. Some people took a power nap and some even came up with the great idea to use some sun cream. beautiful sceneries. While looking around and taking pictures, we suddenly saw it: the gondola that was supposed to be our destination of the hike. Frankly, it was still quite far away, so we better hurry up a bit. It was weird though that the trail continued downhill… That is when we became doubtful whether we were on the right trail or not. A local hiker could confirm that we actually weren’t. Without noticing, we left the official sea-to– summit trail already hours ago and hiked the Stawamus Chief instead. Next surprise of the day! There was nothing else we could do, but walking down again. So that is what we did until we reached the base of the gondola again. Since there was still time left until the last ride down, some of us decided to take the gondola up. And what a beautiful outlook we had waiting for us at the top: White Mountains, a blue sea and a green forest. Amazing! We walked over a suspension bridge and enjoyed both the sun and the landscape. After riding down the gondola (surprisingly, no one wanted to hike), some of us took another ten minute walk to the Shannon Falls. Impressive to see how much water can come down from a mountain. We rounded the day off with dinner and laughs about this day full of surprises. At least the bus ride back to Vancouver did not have any problems and we could all get our well-deserved sleep. I had a great day and was happy that so many of you joined us on this adventure! Sunday, it was time to relax. Well, only in the morning though, because the next active program was already planned for the afternoon. We only trained our legs Saturday, so it was time to get the arms active as well. We reserved our seats for a dragon boat session during the Community Paddling Day of the Dragon Zone Paddling. Perfect weather for that! After a short introduction, Stefan, Lisa, Lotte, Angy, Nadine and I were equipped with lifejackets and paddles. So, we spend our afternoon learning how to paddle in a dragon boat on False Creek. As a highlight of this hour, we could spot a sea lions’ head above the water. Finally, we competed with the other boats in fun races. I spent the rest of the afternoon with coffee and our paddling crew at the seaside enjoying the sun. Take care of your sunburns and see you on Wednesday for our PuB NiGHT! 3, 2, 1… It’s Rocky Mountains time! I’m sure we’re all counting down the days. Because in only a few days, we are going on one of the best trips of the year: the Rocky Mountains! Four days packed with fun and exciting moments are ahead of us. But what exactly is the plan and what do you all have to bring? I will gladly inform you about this in the following few paragraphs. We are meeting early in the morning this Friday. At 7am to be exact. The meeting point is at the corner of Seymour and Cordova Street. Be there on time, because the bus won’t be waiting for you! We’ll be having lunch in Kamloops and we will arrive at our hotel around 6pm. This day is used especially for travelling, but you will see lots of beautiful nature anyway. Saturday starts at 7:45am with the departure from the hotel and the pick-up of our breakfast. We will do lots and lots of sightseeing today. Curious how much sightseeing? Here it goes: First stop: Mount Robson. Second stop: Jasper. Third stop: Athabasca Falls (where we have lunch). 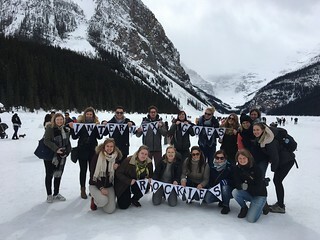 Fourth stop: Columbia Icefields Centre. Fifth stop: Peyto Lake. Sixth stop: Bow Lake. Seventh stop: Checking into the hotel and visiting Lake Louise. See? I told you we’ll see a lot. After a good night’s sleep, it’s Sunday already! We all start the day at 7:30am with breakfast at the hotel. We are leaving the hotel at 8am and are heading to Johnston Canyon. From 11am on, we can enjoy some free time! 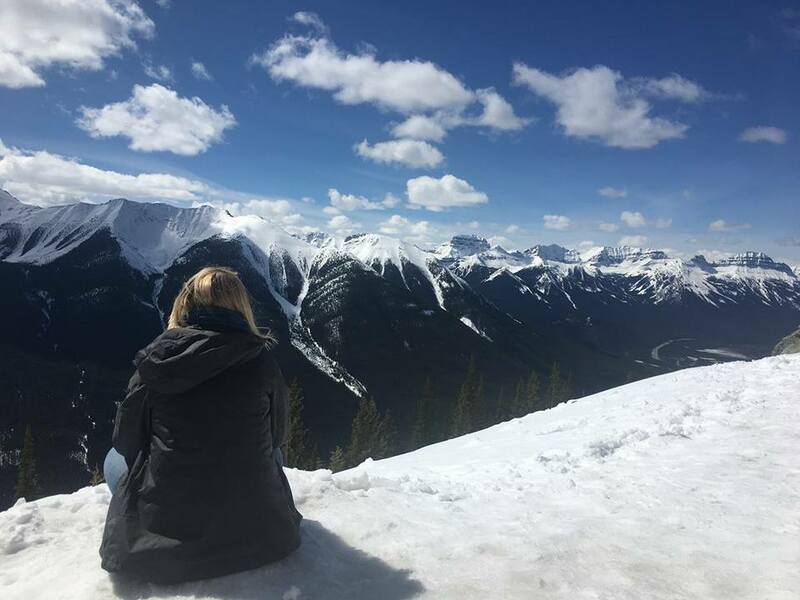 You have the chance to use the Banff Gondola, soak in hot springs or discover Banff by yourself. Later in the afternoon, we head to Emerald Lake and afterwards, we will check into our accommodation for the night: Mountain cabins. And because being in mountain cabins only isn’t good enough, we’ll have a campfire with s’mores and hot chocolate in the evening. The ultimate Canadian experience. But, all good things come to an end. It’s Monday already. Our last day is spent with travelling again. We depart from the hotel at 8am and we’ll have lunch in beautiful Kelowna this time. The estimated arrival back in Vancouver is at 6.30pm. Time to say goodbye to everyone and wipe away the tears. I am really looking forward to Friday, not only because of the trip, but because many of you will join me and we will have an amazing time. My name is Alan, I’m a 22 years old guy from Brazil. Currently I’m studying Mechanical Engineering in Salvador – Brazil. I always had a dream of living in another country and also the English became a necessary language in my future working area as a mechanical engineer, so I mixed a dream with a necessity and… I found Canada. I had to choose between some other countries and Canada, but I saw something more interesting in Canada and definitely I’m happy that I chose the best. I didn’t choose INTERNeX, it was a partnership between INTERNeX and the company from my country. But if I had to choose, INTERNeX would be my choice. INTERNeX was extremely helpful introducing Vancouver to me and giving me support to find a job in my first days. I participated in the program Working Visa Holiday. I chose this program, because it gave me a working visa, giving me an opportunity to live in Canada by myself with my work, while I studied English and travelled in Canada. I worked at The Chopped Leaf in Downtown Vancouver. It was a salad restaurant which had a big variety of salads, sandwiches etc. The work wasn’t easy, because we didn’t have time to stop, but the good communication with the costumers and co-workers always made my work and my English better everyday. Working in a restaurant seems to not have a specific necessity of characteristics and skills, but it’s wrong. You need to be energetic, a good listener and always open to learn new ways to do things. When I arrived in Vancouver I lived in a homestay for a month and after that I found a basement on a website which I stayed until my last day in Canada before coming back to Brazil. Cold and rain, that was my first impression about Vancouver, but shortly after I fell in love with every detail of Vancouver. I could check why Vancouver was one of the best cities in the world to live. Beautiful mountains behind the big buildings, green area, good people and multiculturalism made me impressed. The safety always made me impressed with Vancouver and Canada. As my first time living far from my family and in my own place, I had to learn everything about housekeeping and cooking and also mix working and studying, what made my routine sometimes too tiring. I attended to several activities with the INTERNeX team. Every Wednesdays were full of good moments and unforgettable times. The Rocky Mountains trip stays in my mind everyday. Definitely my best moments in Canada, INTERNeX was present directly or not. If I make a real list of activities, it would have more than 20 pages. But my favourites activities were: Hiking, snowboarding, pubs, nightclubs, cycling and outdoor activities. I was always open to new activities though. 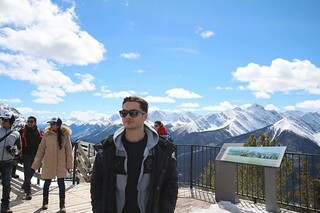 In Canada I travelled through the Rocky Mountains and stopped in some cities like: Jasper, Banff, Kelowna, Kamloops etc. And also visited some cities to the north of Vancouver such as Whistler and Squamish. The most memorable thing about Canada are the friends I made. I arrived in Canada alone and came back to Brazil leaving a family in Canada and spread in the world. I made friends I can count on them and they will be always in my best memories of Canada. The first thing I thought I would do when I came home was enjoying my family and the beach, but I just study everyday so far hahaha. After this experience I definitely know that my travels will not stop. I didn’t decide yet, but New Zealand and England seam good places to travel, but for sure Canada will be one that I want to go back. How my weekend was? Hmm.. I can’t decide which word describes this weekend the best: great, wonderful, awesome, perfect, gorgeous, fabulous, fantastic, spectacular or exceptionally good? At least I had a lot of fun, because this weekend was our trip to Kelowna. Oh, now I got your interest? Well, sit back and read all about our adventures in this beautiful city. The adventure started Friday at 12 pm at the Pacific Central Station. People showed up with their suitcases and bags to get in the bus. And there we go, a five-hour ride to Kelowna! We saw some beautiful views on our way. After a long sit we arrived in Kolowna. We dropped our stuff in our rooms and walked to this awesome steakhouse. One of the hardest decisions was: What are we going to eat? So many nice choices like burgers, chicken and ribs. When the hunger was gone and we finished our meals it was time to have a little party at the hotel. We played some fun games and, since it was carnival, we played some nice carnival music. *BIEP BIEP BIEP* At 6:45 the alarm went of. Time for all the skiers and snowboarders to get some breakfast and prepare ourselves for a day in the snow. After one hour in the bus we arrived at the Big White. In the lift to the top we realized how beautiful the view is from there. A sky as blue as a millionaire’s swimming pool. We went down a lot of times from different slopes. The area was very big, so we could do every time a different slope to see them all. The trials where not crowded at all, so many times we had the mountain for ourselves. We ended the day with a beer during the après ski next to the campfire. Then it was time for us to take the bus back to our hotel. We had a little time to prepare ourselves for another dinner and night out. This time we went to an Asian restaurant next to the hotel. Also here we enjoyed some delicious food. We decided to taste our wines we bought at the wine tasting tour and do another fun game before going to Sapphire, the biggest club in Kelowna. A 00’s party was going with a DJ who played all our classic sing-alongs. Rise and shine, a new day has arrived. We woke up fresh and energetic to start the day with a boost. Ok, maybe not, but at least we stood up to have breakfast. When the rooms were clean and the luggage was packed, we took the bus to Kelowna downtown. In the city we did the scavenger hunt game. The groups had to do as many fun assignments as possible to get points. So we proposed, hugged, fished, danced and so on. After three hours, we met at the bus again to get our luggage and go home. This time we could enjoy a bus ride for 7 hours. Since we did not sleep that much this weekend, we could catch some sleep during the ride. It was really great to hear that all of you had a great time! And so did we! Thanks to you, it was a really nice weekend. If you did not went on this trip, I am happy to tell you all about it tomorrow at PuB NiGHT in the Lamplighter. See you then!